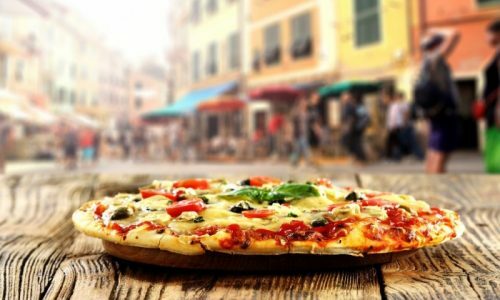 Everyone knows that Italy is famous for the pizza, however you may not realise that different regions in Italy have their own distinct pizza style. Let us show you what some of Italy’s regions have to offer when it comes to pizza! But not before you try the iconic Neapolitan pizza! It’s so good that the pizza has been recognised by the European Union as a “Guaranteed traditional speciality”, how many pizzas do you know which are that good?! The “Pizza Margherita” was created by Neapolitan chef, Raffaele Esposito in 1889. Esposito garnished the pizza with basil, mozzarella and tomato to match the new flag of the recently independent Italy. Legendary pizza. Milan’s pizzas are brilliant in their own little way. Milan has created mini pizzas called “Panzerotti” which are similar to another pizza style which originated from Naples known as a “calzone”. However the Panzerotti is different from its Neapolitan counterpart, the Panzerotti is tiny. The Panzerotti seems more like a snack more than a meal but it’s a brilliant and delicious style of pizza. Like the city itself, pizza from Rome has a long history. The pizza’s dough is like the Roman flatbread which gives the pizza a very authentic look and it follows the capital’s history and culture. The dough is very stretchy and unlike some other pizza dough, it is made with tougher wheat and more water. The pizza itself is super thin, my favourite type of pizza! Overall, whatever debate surrounds where pizza actually originated from, and wherever in Italy you believe it was invented, you cannot deny that Italy has created some of the most iconic pizzas!